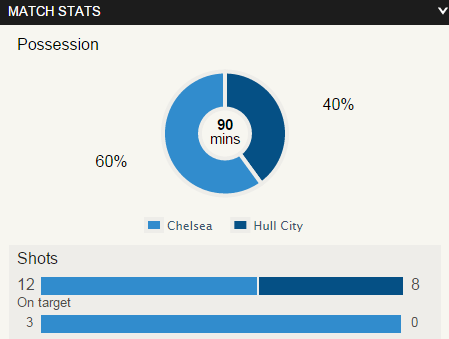 Chelsea beat the 10-men Hull City side and keeps their top place in the Premier League. Thanks to Eden Hazard and Diego Costa for two vital goals to clinch a victory against the Tigers. Jose Mourinho's side beat 10-men Hull City to keep their top place in the Premier League table. Thanks to Eden Hazard and Diego Costa for the two vital goals which clinched a victory against the Tigers. It all started when Eden Hazard scored the goal from his head on the 6th minute of the game. The game continued with the same score line until the 68th minute of the clock strikes when Hazard provided Diego Costa a chance to score his 12th League goal of the season. 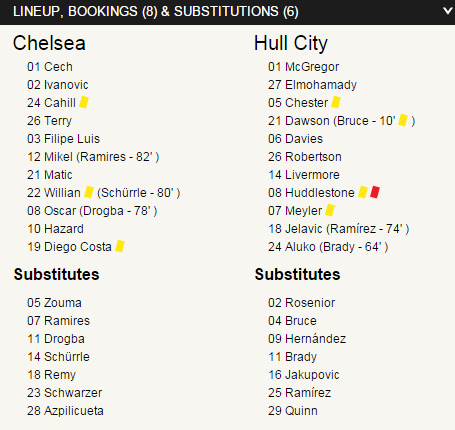 However, before he second goal, on the 60th minute Hull City midfielder received a red card by referee Chris Foy for a knee-high challenge on Chelsea left-back Filipe Luis. On 78th minutes Didier Drogba replaced Oscar. Two minutes later the home side introduced a new face Andre Schurrle to extend Chelsea’s lead but failed to extend it and finished the game with the same scoreline. Petr Cech who started his first Premier League game this season successfully claimed his first clean sheet for Chelsea in the League. Chelsea maintain their winning record of eight consecutive games at Stamford Bridge. They are on top with 39 points while Hull City remain in the relegation zone with 13 points.